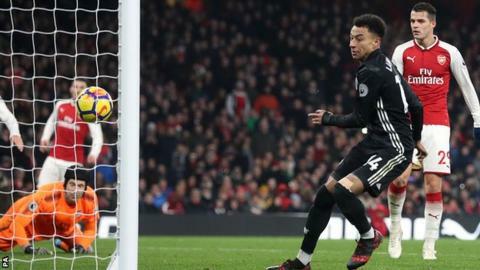 Manchester United ruthlessly punished defensive errors to become the first side to win a league game at Arsenal since January in one of the matches of the season so far. Jose Mourinho's side were reduced to 10 men late on when Paul Pogba was sent off for a dangerous tackle and they were aided by a stunning goalkeeping display by David de Gea throughout. But they did telling damage early on when Antonio Valencia pounced on a loose Laurent Koscielny pass to drill the opener, before Jesse Lingard side-footed a second after robbing Shkodran Mustafi to link smartly with Romelu Lukaku and Anthony Martial. The strikes meant United had scored as many goals in 11 minutes as they had in eight away fixtures against the Premier League's so-called 'big six' clubs. An end-to-end first-half, which delivered 20 shots on goal, saw Arsenal hit the woodwork through Alexandre Lacazette and Granit Xhaka during a frenetic goalmouth scramble, before De Gea denied Hector Bellerin, Sead Kolasinac, and spectacularly prevented a Lukaku own goal. The Spaniard could do nothing about Lacazette's simple finish on 48 minutes but after Lingard had hit the post in a breathless start to the second half, De Gea produced an unbelievable double save from Lacazette and Alexis Sanchez. His heroics maintained the advantage during an opening 15 minutes to the second half which saw United have just 26% of possession, but Lingard was on hand to tap in a third on 63 minutes after good work by Pogba. Pogba was dismissed when he mistimed a tackle to effectively stamp on the back of Bellerin's leg, and the Frenchman will now miss the Manchester derby next Sunday. But his moment of woe felt merely a footnote in a riveting encounter which moved second-placed United to within five points of their city rivals. Mourinho has garnered a reputation for defensive set-ups on trips to the league's traditional big clubs but his side went after their hosts early on, hounding possession high up the pitch to great effect. Their opening two goals owed much to slack use of possession by the home side but needed clinical finishes, notably when Martial cleverly flicked into the path of Lingard for the second. The reward for their adventure secured a first win for Mourinho in his past 12 away fixtures against the 'big six'. He could be forgiven for not enjoying seeing Arsenal fire 33 shots at goal and said he later told De Gea - who equalled the league record for saves in a match - he had witnessed the "best from a goalkeeper in the world". Arsene Wenger also labelled De Gea "absolutely outstanding" but while his brilliance points to United riding their luck at times, they were impressive in offering a balance between defence and attack. Nemanja Matic was consistently well placed, never more so than when blocking a goal-bound Aaron Ramsey shot with the score at 2-0. And the presence of the defensive midfielder once again freed Pogba, who in bursting into the box to lay on Lingard's second now has five assists this season, surpassing his four in the previous campaign. Whether Mourinho will choose to live so dangerously against Manchester City next week remains to be seen, but those watching from a neutral stance would be fortunate to see a game as good as this one again. Wenger spoke of a "good performance" and "impeccable attitude" from his players but he will be familiar with this feeling. Only twice in 18 meetings with Mourinho has he got the upper hand and the charitable way in which his side gave away goals will not sit well. Koscielny's cross-field pass and Mustafi's indecision ultimately left a mountain to climb if Arsenal were to record a 12th straight home win in the league. The ease with which Pogba sauntered into the area to create a third just as Arsenal were seeking to build on Lacazette's goal also smacked of weakness. Arsenal can justifiably feel aggrieved by a penalty shout that was turned down late on when Danny Welbeck was caught by Matteo Darmian but by that point, the 10 men of United had finally managed to calm a frantic affair. Wenger's side drop out of the Champions League qualification places into fifth. They were superb going forward at times and will scratch their heads as to how they only found the net once but, not for the first time, it was at the other end where their shortcomings showed up. In what is possibly one of the easiest man of the match decisions in the history of BBC Sport, David de Gea gets the nod. He provided resistance when Arsenal chased the game and made 14 saves, none more impressive than the double save from Alexandre Lacazette and Alexis Sanchez. It was a magnificent game of football. We have talked about Manchester City going forward but what we saw at times from Manchester United was equally as good. They were just breaking, too quick and too sharp with their pace and their power. They went after Arsenal, put them under pressure and wanted to get behind their defence, and Arsenal could not cope with their one- or two-touch football. It was great to watch, and Manchester United were too good and too clever for Arsenal. Superb. I think De Gea is the best goalkeeper in the world. He was brilliant. I think it is a red card. It looks terrible. It was dangerous and he was endangering his opponent. Arsenal manager Arsene Wenger said: "David de Gea was man of the match by a clear mile. "We played well but there is nothing more frustrating when you have that quality of performance and nothing to show for it at the end. The attitude was impeccable until the end. But you cannot make the mistakes we made at the beginning." Manchester United manager Jose Mourinho said: "I loved the way my team played and fought. Arsenal played in some period amazing attacking football - creating difficulties for us. "But I have to say that my players deserve all the great words. I don't know so many in English but amazing, phenomenal, fantastic. They deserved three points." Arsenal suffered their first home league defeat since losing 2-1 to Watford in January. Manchester United have won more Premier League away games at Arsenal than any other side (8). David de Gea made 14 saves in the game, the joint-most in a Premier League game since 2003-04, when Opta started collecting this data. Vito Mannone and Tim Krul have also made 14 saves in a fixture. Paul Pogba has scored four goals and assisted six more in his past nine Premier League appearances. Alexandre Lacazette has scored more home goals in the Premier League this season than any other player (six). Arsenal will follow Thursday's Europa League home game against BATE Borisov (20:05 GMT) by visiting Southampton on Sunday, 10 December (13:30). Manchester United need a point at home against CSKA Moscow to progress in the Champions League on Tuesday (19:45) and then host Manchester City on Sunday, 10 December (16:30). Match ends, Arsenal 1, Manchester United 3. Second Half ends, Arsenal 1, Manchester United 3. Offside, Arsenal. Alexandre Lacazette tries a through ball, but Nacho Monreal is caught offside. Substitution, Manchester United. Marcus Rashford replaces Ashley Young. Attempt missed. Aaron Ramsey (Arsenal) right footed shot from the centre of the box is too high. Assisted by Mesut Özil. Ander Herrera (Manchester United) is shown the yellow card. (Manchester United) wins a free kick in the defensive half. Attempt saved. Nacho Monreal (Arsenal) header from the centre of the box is saved in the top left corner. Assisted by Mesut Özil with a cross. Laurent Koscielny (Arsenal) is shown the yellow card for a bad foul. Romelu Lukaku (Manchester United) wins a free kick in the attacking half. Attempt blocked. Alexandre Lacazette (Arsenal) header from the centre of the box is blocked. Assisted by Mesut Özil. Attempt blocked. Alex Iwobi (Arsenal) right footed shot from outside the box is blocked. Assisted by Nacho Monreal. Attempt blocked. Alexis Sánchez (Arsenal) right footed shot from outside the box is blocked. Assisted by Aaron Ramsey. Attempt missed. Danny Welbeck (Arsenal) header from the centre of the box is too high. Assisted by Aaron Ramsey. Attempt saved. Danny Welbeck (Arsenal) right footed shot from outside the box is saved in the top left corner. Assisted by Alex Iwobi. Attempt blocked. Alexandre Lacazette (Arsenal) right footed shot from the right side of the box is blocked. Assisted by Alexis Sánchez. Attempt blocked. Aaron Ramsey (Arsenal) right footed shot from outside the box is blocked. Assisted by Alex Iwobi. Substitution, Manchester United. Matteo Darmian replaces Jesse Lingard. Substitution, Arsenal. Olivier Giroud replaces Sead Kolasinac. Delay in match Héctor Bellerín (Arsenal) because of an injury. Paul Pogba (Manchester United) is shown the red card. Corner, Arsenal. Conceded by Marcos Rojo. Substitution, Arsenal. Danny Welbeck replaces Granit Xhaka. Attempt blocked. Mesut Özil (Arsenal) left footed shot from the left side of the box is blocked. Assisted by Alexis Sánchez. Substitution, Manchester United. Ander Herrera replaces Anthony Martial. Offside, Arsenal. Nacho Monreal tries a through ball, but Alexandre Lacazette is caught offside.